Guest blogger Tyaga Iyer examines why it is crucial for banks to manage risk efficiently through improved stress testing practices. Have banks in India learnt their lesson from the 2008 economic crisis and built the resilience to withstand any future shocks? If their alarmingly high level of bad loans is any indication, they still need to go a long way. Between 2012 and 2016, their non-performing assets (NPAs) almost tripled. This when they either declined substantially or increased marginally in other countries. Obviously, banks in India have not been able to adequately assess the risks they are exposing themselves to. And just how much risk is good risk? This is where stress tests come in. They are designed to understand whether banks have enough capital to survive adverse economic conditions. Stress tests can help identify banks’ risk appetite and mitigate the impact of market changes. Now, the 2008 global financial meltdown was a direct result of suboptimal stress testing in banks. Shaken, most global banks have adopted stringent stress testing practices to help manage their risks and protect themselves from shocks. 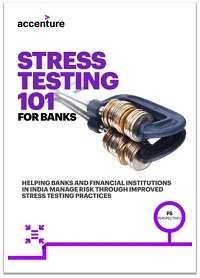 Banks in India realize stress testing is crucial for safety in today’s volatile economy. Some are already doing their bit to improve risk assessment. However, they aren’t doing it right. Following just the traditional top-down approach has led to inadequate analyses. The right mix of top-down and bottom-up approaches is the secret sauce to building resilience and keeping NPAs at bay. But to successfully implement the mixed approach, banks and financial institutions must address the following issues: cultural inertia, data quality, and standardization of industry and sector classification. Stress testing is not a mere regulatory exercise anymore. It’s not just about managing risks or surviving stressful times. Banks can use the insights from stress tests to make smarter business decisions and strategic choices, and boost profitability.